Sticking with your fitness routine while traveling is an important part of keeping your body in its ideal physical and mental state. Not only can a workout mitigate jet lag by helping to reset your internal clock through proper rest, but it can also make you feel more positive, which allows for a more restful mind and, in turn, more restful sleep (read: faster jet lag recovery). So, when you’re on the road, do you find a small-class studio or a private trainer? And where and how do you even look for either? Sure, you can always exercise in your hotel room. (My personal favorite is a Tabata-style HIIT workout featuring 20 seconds of hard work and 10 seconds of rest, repeated eight times. Choose four different exercises using similar muscle groups with a full minute off between each.) But for travelers who really thrive in a gym environment, sweating it out in a hotel room isn’t always a great option. Fortunately, with these easy tricks, tips and hacks, you can maintain your fitness regimen and find a gym, studio class or personal trainer no matter how far away from your local gym you travel. The first and most obvious solution is to choose a hotel with a gym. 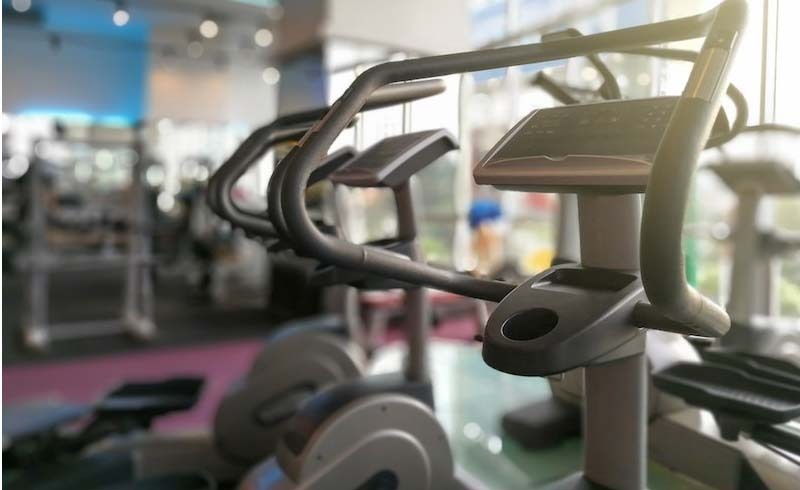 Larger, branded hotels in a four-star or higher category are likely to have a gym that will meet your needs; but staying at a hotel with a fitness center isn’t always an option. A second option would be to seek out the local gym chains or ask if your hotel has a partnership with any local gyms. Well-known fitness centers like Equinox, Crunch, Golds and LA fitness typically offer day passes, but are mostly limited to domestic destinations and metropolitan locations. Day pass rates can range depending on the company. I’ve paid as little as $10 for a day pass to a Planet Fitness in a small, mountain town in Pennsylvania and have heard of some day rates for the more “chic” brands charging $50 per day in Los Angeles, San Francisco and New York City. One way to take advantage of these branded gyms while traveling is to call ahead or go online to request a three-day trial offer. Just tell them you’re interested in checking out the facility. I’ve personally tried this hack and have never had an issue, even though I didn’t reside in the city where I was using the pass. When the large, branded health clubs aren’t an option, there are always local boutique gyms. These are usually operated by a single owner and are more likely to offer affordable day rates for visitors. I generally have had a lot of success with these gyms throughout Southeast Asia and Europe, where I’ve paid as little as $2 to $10, respectively. If you’re traveling abroad and aren’t familiar with any of the nearby fitness centers, there are a few ways you can make sure the gym will accommodate your needs. Sure, you can try a Google search, but this can often return too many options and vague websites. Instead, ask your hotel’s concierge to recommend his or her favorite gym nearby. Personally, I love using Zeamo, an app that allows you to explore more than 25,000 gyms worldwide and even purchase a day pass straight from your device. But honesty, one of the best features may be that you can see the images of the facility and a description of all the amenities offered. Another great option for travelers who don’t want to miss a beat with their exercise routine is a studio class: typically a coach or instructor-taught session with a small to medium-size group. Today, most cities and large towns offer a dizzying variety of class options. Some of the most popular include boxing, cycling, yoga, pilates and HIIT (High Intensity Interval Training), just to name a few. Make sure your choice of class is with a certified and trained coach or instructor. If you’re not married to any one type of class, I suggest seeking out HIIT classes where you can burn the maximum amount of calories through a full-body workout. Don’t recognize any of the studios where you’re staying? Again, ask the concierge, or see if it pops up on ClassPass. Sure, you can purchase a membership (there’s usually a free trial, too) but you can also simply use ClassPass to identify high-quality studios and unexpected activities near you. It’s currently available in about 50 cities around the world. If you have the money to spend, hire a private instructor or coach. With a dedicated professional helping you achieve your fitness goals, you’re guaranteed to receive the most customized and personalized program now matter where in the world you go. But it will cost you! Elite, experienced and highly credentialed trainers can charge anywhere from $125 to $275 for an hour-long session. Finding trainers who fall into the elite category and specialize in what you’re looking for can be tricky. I suggest contacting the smaller gyms in the area and asking them for referrals. Or, turn to social media to find trainers in the area and ask for guidance. Taking a look at a trainers’ social media platform or website should give you an idea of what type of specialized technique he or she offers.